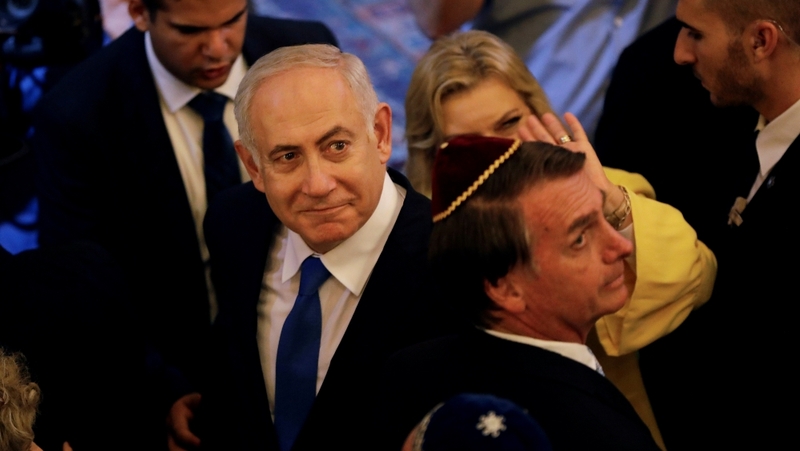 Speaking during a meeting with leaders of Brazil’s Jewish community in Rio de Janeiro, Netanyahu said the country’s President Jair Bolsonaro told him that it was “when, not if” he moves the embassy. Netanyahu, who is the first Israeli prime minister to visit Brazil, held an official meeting with Bolsonaro on Friday. After the meeting, Bolsonaro said that “we need good allies, good friends, good brothers, like Benjamin Netanyahu”. Netanyahu said that the Brazilian accepted his invitation to visit Israel, a trip that is likely to take place in March. However, neither man raised the embassy issue when they spoke to journalists shortly after their meeting. Nor did they post anything on it on their Twitter accounts, despite Bolsonaro in particular being a fervent social media user. Bolsonaro is hosting Netanyahu and the leaders of other counties for his inauguration which is taking place in the Brazilian capital, Brasilia, on Tuesday. The new leader said in early November he intended to follow the lead of US President Donald Trump in moving his country’s embassy from Tel Aviv to Jerusalem. But he later backtracked. He is under intense pressure from Brazil’s powerful agriculture sector not to so, as it could hurt Brazilian exports to Arab nations who view East Jerusalem as the capital of a future Palestinian state. The Arab League had told Bolsonaro that moving the embassy to Jerusalem would be a setback for relations with Arab countries, according to a letter seen by Reuters news agency earlier in December. The embassy relocation would be a sharp shift in Brazilian foreign policy, which has traditionally backed a two-state solution to the Israeli-Palestinian conflict.